"Wait… Is this my drink? Oh, it's yours? Then which one is mine?" There's a super-easy way to banish this conversation from your future parties. 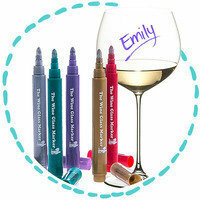 Keep a set of these best-selling markers on hand, and your pals can label their beverages however they like! The ink easily washes off glass, the price is right, and the whole process is a fun conversation starter. 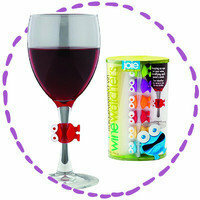 Bonus: These are GREAT for customizing gifts like bottles of wine (and for leaving silly messages on the bathroom mirror for your significant other)! Fizzy flavored water and no-calorie soda are the ultimate guilt-free cocktail mixers, but why limit yourself to what’s available in stores? With this gadget, you can easily bubble up your own brew in seconds! Stock up on flavors like Diet Cranberry Raspberry, Mango Fruit Drops, and Diet Strawberry Watermelon. There are even low-calorie mixes like Pink Mojito and Bahamas Pina Colada! 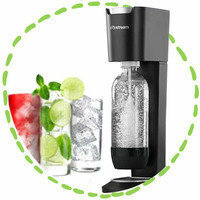 Of course, SodaStream is also great for everyday use, especially with those unsweetened natural essences. Score the complete kit on Amazon, and then grab your favorite flavors. If you like to take your fun outside for a picnic, backyard BBQ, or pool party, this is a super-smart set of glasses to bring along. The shatterproof cups are made of soft silicone, so there's no risk of breakage, and their flexible form makes them so easy to pack. Who wants their good time derailed by broken glass? Exactly. Be prepared! Anyone who likes fruity, sweet, and unique cocktails with low calorie counts should have a copy of this book in their collection. It’s crammed with easy recipes for margaritas, blended beverages, classic cocktails, and creative crowd-pleasers. 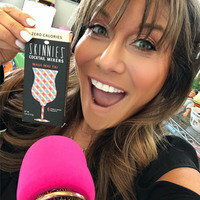 There are even recipes for bar bites and other party food favorites! One of the best treats in the book: the 90-calorie Tropical Vanilla Pudding Shots! Get yours via Amazon (copies are going fast -- last we checked, it was a whopping 40% off), or click here to shop around. Join Lisa for a Virtual Happy Hour with Tips, Tricks & More! ... and tons more happy hour info and conversation! We hope your happy hour is a smash! FYI, we may receive compensation from some of these links. OH, WOW! Today, June 22nd, is the 8-year anniversary of the release of Hungry Girl Happy Hour! Coincidence? Maybe, maybe not. Regardless, raise a Magical Low-Calorie Margarita with us! Take one down, pass it around… Click "Send to a Friend" to get your pals in on the fun!